Primary Natural Resources precious metals, natural gas. 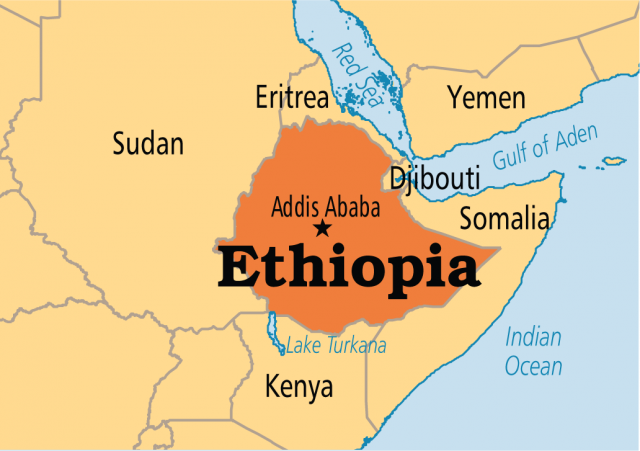 ETHIOPIA IS LOCATED in northeastern Africa, an area rich in geography, climate, and history. The Great Rift Valley, which extends across most of east Africa, bisects Ethiopia’s central mountainous plateau, providing the country with highlands, mountains, plains, and climatic diversity. The heaviest rains occur in the summer months with a lighter rainfall in the spring, when the monsoons arrive from the INDIAN OCEAN. Rains in the south and southwest of the country are nearly continuous over the year, moderating temperatures in the highlands, where most of the population lives, and leaving the eastern plains drier and hotter. The capital, Addis Ababa, is located at 8,000 ft (2,450 m), with average yearly temperatures of 68 degrees F (17 degrees C). The nation’s major river, the Blue Nile, is fed by runoff from the western portion of the plateau and flows toward the NILE and SUDAN to the west. Ethiopia’s forests and wooded areas are concentrated in the southwest, and are centers of coffee production, while cattle are grazed on the grasslands. Despite its climate, Ethiopia faces severe deforestation and DESERTIFICATION problems, mainly caused by the civil war, drought, and famines. Ethiopia is rich in human history. The earliest known hominid, “Lucy,” was unearthed in 1974 near Addis Ababa and was dated to 3.5 million years ago. Archaeological research indicates continuous human habitation for the past 2 million years. Neolithic civilization entered Ethiopia from EGYPT and the RED SEA, indicating a trading network that connected the area to the Mediterranean and Arabia. Traditional Ethiopian history started when the Queen of Sheba, purportedly from Ethiopia, visited King Solomon in the 10th century B.C.E. Historically, however, Ethiopian history originated in the second millennium B.C.E. under the influence of the Egyptians and later Greeks. An independent Ethiopian civilization emerged in the 1st century C.E. in Aksum and its seaport, Adulis. The Aksumite kingdom traded with the peoples of the Red Sea and interior of Africa. In the 4th century C.E., Greek missionaries introduced Christianity from Alexandria, EGYPT. In 451, exiled Greek and Syrian monks established Monophysite Christian communities throughout the kingdom furthering the influence of the Egyptian Coptic rather than the Roman Catholic Church. In 525, the Aksumite king, responding to a request from Emperor Justinian I to aid persecuted Yemeni Christians, invaded and occupied the southern portion of the Arabian Peninsula until the Aksymites were expelled by the Muslims at the end of the century. The Aksumites, however, used their expanded holdings to trade with INDIA and maintain communication with the Byzantines. This period of expansion was not long lasting because by the middle of the 7th century, Islamic invaders from Arabia conquered Egypt, isolating the Auxites from the broader Christian world. Isolation meant a gradual political decline over the next 300 years, with central authority collapsing in the 10th century. Ethiopia entered a period of warring chieftains and provincialism. Finally, in the late 13th century, the Solomonic dynasty, so named after its lineage to King Solomon and the Queen of Sheba, reestablished central authority with the new dynasts claiming the title of Negus Negusti, king-of-kings. The kingdom consolidated political and military power and expanded against a series of smaller Muslim principalities to the south. During this period of renewed expansion, Europeans reestablished contact with the Christian Ethiopians. In 1490, Portuguese explorers searching for the legendary Christian kingdom of Prestor John arrived and subsequently aided the Ethiopians against the Muslims. Relations with the Europeans soured when the Portuguese tried to pressure the Ethiopians into accepting Roman Catholicism. The Ethiopians then expelled the Europeans and enacted a strict isolationist policy, which lasted until European imperialism encroached into Africa during the 19th century. In 1869, Italian imperialists purchased the nearby Red Sea port of Assab from the Egyptians. In 1882, Italy acquired the surrounding territory and merged their holdings into a single colony. Not satisfied, the Italians expanded northward along the coast into territory claimed by the Ethiopian kingdom. To avoid potential conflict, the Italians and Ethiopians agreed in 1889 that Italy could expand into limited areas of northern Ethiopia. Tensions mounted, however, after Italy formed the colony of ERITREA and became involved in a dynastic struggle in Ethiopia. The tensions touched off a native uprising in Eritrea, leading the Italians to invade Ethiopia hoping to end any aid given the native Eritreans by Ethiopia. The Ethiopians soundly defeated the invaders in 1896 at the Battle of Adowa, thereby ensuring the empire’s continued independence from European imperialism until well into the 20th century. The Italians vowed revenge, and in 1935 the Italian fascist regime invaded and conquered Ethiopia. Emperor Haile Selassie fled to Great Britain and remained in exile until the Allies liberated Ethiopia and Eritrea in 1941. Selassie returned to power and in 1952 ruled over a federal system of Ethiopia and Eritrea until the early 1960s, when he annexed Eritrea. In 1974, the Derg, a military council, overthrew the emperor and eventually imposed a totalitarian regime with Soviet aid. In 1991, the rebel Ethiopian People’s Revolutionary Democrat Front, a coalition of the various domestic opposition groups, overthrew the government and promulgated a new constitution. Under pressure from ethnic minorities for more local government, the new government subdivided the nation into nine provinces with a legislative assembly.